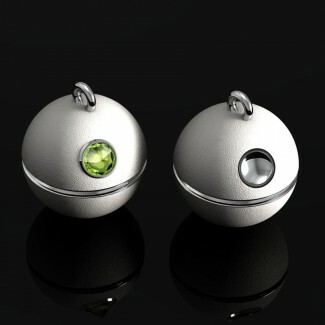 Concept Piece - Show your interest by contacting us! Saturn has over 60 moons and Mimas is my personal favorite. Mimas was once hit with a large high speed asteroid giving it a large creator relative to the size of it's own body. The universe must have a sense of humor given that the moon looks like pop culture icons from movies or video games that existed before Mimas could be seen in high enough resolution to make out its creator or map the surface heat. 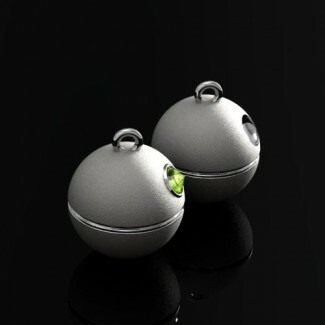 These hollow earrings are set with either reverse set Peridots or without stones and instead with a concave surface. Shop our entire gallery including our famous Police Box inspired rings. For news and updates please sign up for our newsletter. © 2017 Art & Gems.